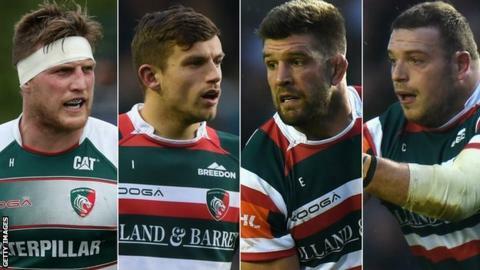 Leicester Tigers have given new deals to Mike Fitzgerald, Greg Bateman, Brendon O'Connor and Jono Kitto. Fitzgerald was last season's player of the year as Tigers made the Premiership and Champions Cup semi-finals. "It's been a great experience playing in the Premiership and in Europe for Leicester," said the 29-year-old. Fellow forward Bateman, 27, flanker O'Connor, 27, and scrum-half Kitto, 24, have also agreed new deals, the lengths of which have not been disclosed. Fitzgerald joined Tigers in the summer of 2015 and has made 44 appearances playing at lock and flanker, scoring four tries. Tigers head coach Aaron Mauger said: "Mike is a very good man to have around the squad. He has a great work ethic in training and on the pitch. "With the experience he has gained in the last 18 months in English rugby, we believe he will get even better in this environment." Bateman also arrived that summer, from Exeter Chiefs, and has played 29 times for Leicester. He achieved the notable feat of playing in all three front-row positions this season. O'Connor signed in the autumn of 2015, scoring a try on his debut in a European Champions Cup win over Stade Francais, and has made 29 appearances for the club. Kitto, meanwhile, moved to Welford Road in the summer of 2015 and has played 24 times for Tigers.